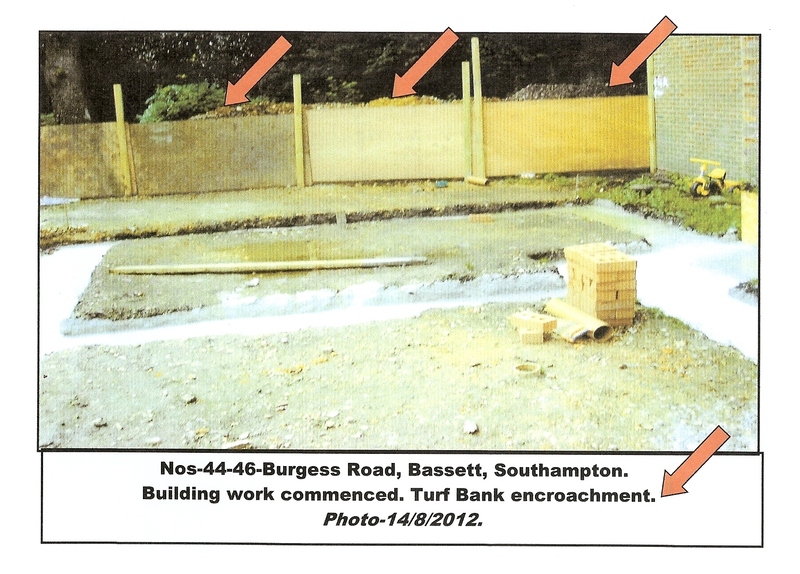 Southampton Common’s perimeter has turf banks which have suffered many years of neglect & encroachment. Many approaches to City Council officers since since 1984 have been unsuccessful to remedy the abuse. City Engineer’s drawing- V/331/15-November 1981-gives details. After the Lands Committee-23/March/1967- The Town Clerk wrote to the properties- -18 to 84- Burgess Road- to confirm City ownership of 3- feet outside the Turf Banks requesting removal of any obstacles/buildings, etc. Today, abuse by gates, steps, wire railings continues. A thorough rework is necessary, indeed overdue. The situation reported to City Council-Chief Executive -Alistair Neil-15/8/2012-for action.